During World War I, soldiers fighting in the Flanders region of Belgium noticed that in amongst all of the devastation, where their fallen comrades lay buried, grew thousands of wild poppy flowers. During the second battle of Ypres in May 1915, having witnessed the death of a close friend, Canadian Medical Officer and soldier, Lt Col John McCrae, wrote the poem “In Flanders Fields”. The opening line of the poem vividly describes the image of the poppies blowing in the wind amongst the many crosses that mark the resting places of fallen soldiers. The poppy has become a symbol of remembrance not only of the fallen soldiers of Flanders Field, but also to commemorate the sacrifices of veterans in all conflicts. 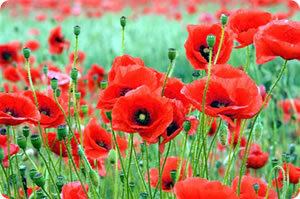 Poppies are worn on lapels from mid October until Remembrance Day on 11th of November each year. All of the poppies sold in Scotland are produced by hand at the Lady Haig Poppy Factory. Our sister charity Poppyscotland coordinates the annual Poppy Appeal in Scotland and the final total for the 2015 Scottish Poppy Appeal is £2.949,865. This represents an increase of £101,092 or 3.5% on the 14 Appeal figures. This, combined with our other year-round fundraising, enables Poppyscotland to provide tailored support and funding to thousands of ex-Servicemen and women as well as other vital services in advice, employment, mobility, respite, housing and mental health support. The figure for the 2016 Poppy Appeal will be published later in the year.